The Farmer-Greens and Social Democrats in Seimas are not waiting for the Social Democrat Party council's decision and intend to sign a memorandum of cooperation over cooperation during the autumn session. "What we discussed with the prefect is that at least during the autumn session, regardless of the party's position, we want to ensure work together with the group. 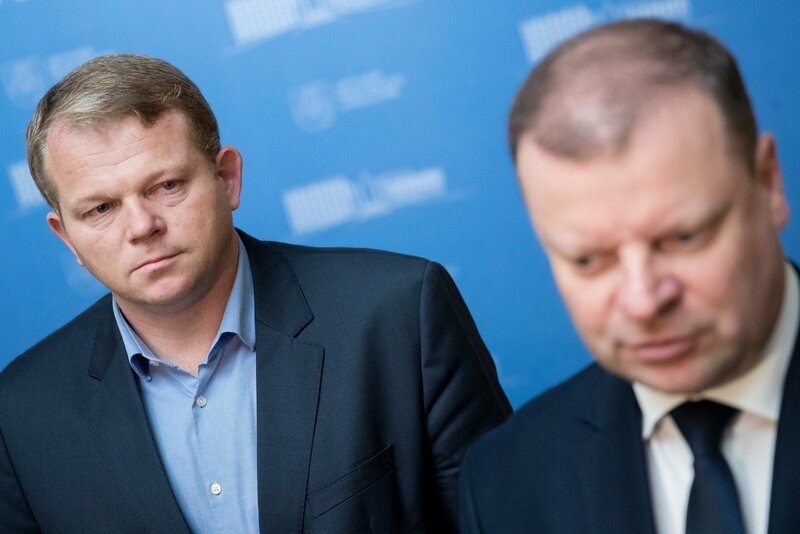 We are at a stage where we are discussing an agreement that needs to be signed by the groups and I see no significant reasons why the Social Democrat and Farmer-Greens groups in Seimas would be unable to work together and support the joint cabinet programme," Prime Minister Saulius Skvernelis said after a meeting with Social Democrat group prefect Andrius Palionis. According to the head of cabinet, the Social Democrat group has displayed initiative in signing the memorandum over political agenda questions which are linked with social policy. "We also want solutions so that the group would be with us in the autumn session regardless, to implement the joint cabinet programme," S. Skvernelis said. The prime minister would want the agreement signed prior to the beginning of the Seimas autumn session. He explained that he did not meet with the Social Democrat Party chairman Gintautas Paluckas because it was decided to meet with the prefects of the political party groups represented in Seimas. That the Liberal Movement group prefect Eugenijus Gentvilas will be accompanied by Remigijus Šimašius, the head of cabinet explained that an exception was made because R. Šimašius is the mayor of Vilnius and discussions are also to be held about the capital. The head of the Social Democrat group in Seimas stated that the party chairman G. Paluckas was presented with the memorandum. "We currently only have the text that we will sign. Whether it will be an agreement or memorandum, I do not think that the group needs the party chairman's permission or authorisation," A. Palionis said. The politician believes that this decision will not clash with the party council ruling which will be made regarding the party's future in the coalition government. "The party position can be passed, that we will leave the coalition. This signed agreement will not prevent it," A. Palionis said. According to him, with this agreement, both groups commit to what they should accomplish during the autumn session. The group prefect was unwilling to predict what will follow after the autumn session, but did not deny that the party's opinion could shift. The group prefect does not believe that such a memorandum is stepping out of line in the party. "Currently the party council ruling is that the Social Democrats are to be in the coalition. I believe that as of currently we are not stepping out of line. If we signed this memorandum after a party council ruling that we are departing, then I would agree," A. Palionis said. After last week's meeting with S. Skvernelis, Conservative leader Gabrielius Landsbergis fully denied that his party could join the coalition government if the Social Democrats were to withdraw. "I do not see any opportunity to join the coalition as of today. There are a number of reasons for this – due to value differences between the groups and perhaps there would be need for a broader discussion in the party, which I do not think would support joining a coalition with the "Farmers" as of right now," G. Landsbergis said, noting that "the Social Democrat group will do everything to remain in the coalition." He did not, however, deny that his party members could support individual "Farmer" initiatives in Seimas, akin to what was done in the case of forestry reform. The prime minister also stated that talks about the need for support are premature because there is still a valid coalition agreement with the Social Democrats. The Social Democrat Party is holding surveys in its branches regarding participation in the coalition government up to the 20th of September. To date 42 of 60 branches have responded; 31 want to withdraw, 6 to renegotiate and 5 to remain. The decision over the party's future in the coalition government is to be made in the party council which, according to A. Palionis, is to be held in October. On Wednesday the head of cabinet will also meet with the Electoral Action of Poles in Lithuania – Christian Families Union group prefect Rita Tamašunienė and Liberal Movement prefect Eugenijus Gentvilas.